Home » Where to Install Solar Panels? Rooftop Solar System or Ground PV System? When selecting the location to install solar panels, several things must be taken into account. You will have two main options: installing your solar panels on the roof or in the ground. Here, we will address some technical considerations and details that you should pay attention to before choosing where to install your solar panels. Let’s get started! The Sun follows a specific path throughout the year, and according to the location, there is a specific angle (azimuth) that benefits solar power production. Generally, there are two main preferences when selecting the azimuth angle of the solar panels. If the place is located in the Northern Hemisphere of the Earth, then the solar panels should face South. On the other hand, places located in the Southern Hemisphere of the planet must face North for maximum energy performance. For the US, your solar panels should face South. If the roof where you have been thinking of installing the solar panels faces South, South-East or South West, then it’s a good spot for them. On the other hand, if the available space on the roof only faces North, then is better to find another spot. The backyard is another possible place for solar panels through a ground mounted system. If the roof only faces North (N-E/ N-W), then possibly the backyard will face South. Consider the orientation as a critical factor for Direct Normal Irradiance values to reach the solar panels and maximize energy yields. Inclination (or tilt angle) is also very important. Roof mounted systems have limited possibilities here, since the angle of the roof will also be the angle for the PV array. The optimum tilt angle will vary according to the season, however, on a fixed PV system, we must choose a single angle that would maximize energy yields across the year. Choosing a tilt angle that is equal to the latitude of the location is a good approach for a solar design. Therefore, if your roof is not designed with an angle similar to the latitude of your business or household, you will have some annual energy losses associated with the tilt angle. Ground mounted systems do not have that problem because they can be literally configured in any tilt position. Your solar installer will design the PV system taking into account several factors, one of them will be the available space for the solar panels. Roof mounted systems have generally complicated scenarios that include limitations in the availability of space. If the space suitable for solar panels is limited or irregular (with interruptions along the way) then the PV design can lead to reductions in performance known as mismatch losses (associated with placing solar panels in different faces of the roof and azimuth angles). Of course, there are methods to balance scenarios with such configurations, but they are generally more expensive (inverters with two MPPTs, two or more inverters, microinverters, or DC optimizers). In some occasions, if the amount of available space and the number of solar panels needed to back up a load (grid-tied with battery backup case) do not match, then it might be needed to reduce the load. Ground-mounted systems can also find themselves limited in this case. It will depend on how big is your backyard and how big your load is. However, an advantage about the ground-mounted system is that you will not have to worry about mismatch losses because all solar panels will face the same direction. Here, you must choose the option that offers better conditions. One of the most constant and important factors to consider when installing a solar panel is the presence of shades that will reduce the energy yields of your PV system. PV systems cannot work efficiently with an object that constantly generates shades in the PV array, therefore the solar designer must take into account the presence of nearby trees, chimneys, antennas, or houses that could cause shade on your solar panels. The only way to measure the losses attributed to near-shadings is through a solar design software that performs shading analysis of the PV system by developing a 3D model of the installation. Near-shading losses should not be above 10% annually (worst case scenario). Since there are infinite possibilities of configurations on roofs or backyards it is hard to establish a winner on this topic, it will simply depend on your particular case. Each type of system has its own advantages and disadvantages. As you can see, regarding orientation and inclination, ground-mounted systems have a wider range of choice, therefore they are preferable from this point of view. However, regarding space and shadings, it is hard to say who would carry the advantage. Other things must also be taken into account, like maintenance for example. 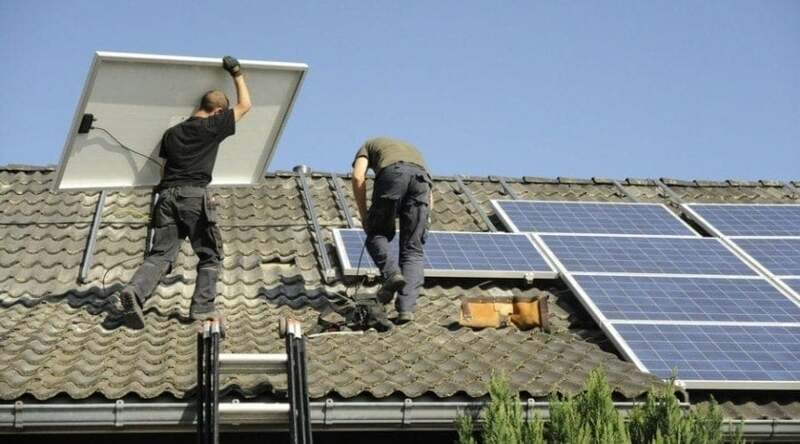 It is a lot easier to clean your solar panels while they are on the ground than going up to the roof and finding a comfortable place to clean them. Cooling of solar panels is also important, and ground mounted systems have leverage on this topic as well because air flows more naturally if they are on the ground. However, ground-mounted systems have disadvantages that are not easily visible. Ground-mounted systems tend to cost more than roof-mounted PV systems because the materials needed for the installation are more expensive. Ground-mounted systems need foundations, so excavations must be carried as well. All of this increases labor costs and installation times. Moreover, think about it. You hardly ever go and stay on your roof, but you may spend a lot of time in the backyard. The day you have a barbecue and there is missing space occupied by solar panels might be frustrating. This something that could end up bothering you in the long run. As you can see, choosing the right place for the installation of your solar panels is harder than it looks. The best way to find the optimum solution in your case is to consult it with your solar installer. Ask him/her all the questions you have and try to find the balance between performance and lifestyle.